Can America blame its obesity epidemic on the higher consumption of added sugars and refined grains? This is a hotly debated topic by both the scientific community and the general public. In this section, we will give a brief overview of the scientific evidence. The Food and Nutrition Board of the Institute of Medicine (IOM) defines added sugars as “sugars and syrups that are added to foods during processing or preparation.” The IOM goes on to state, “Major sources of added sugars include soft drinks, sports drinks, cakes, cookies, pies, fruitades, fruit punch, dairy desserts, and candy.” Processed foods, even microwaveable dinners, also contain added sugars. Added sugars do not include sugars that occur naturally in whole foods (such as an apple), but do include natural sugars such as brown sugar, corn syrup, dextrose, fructose, fruit juice concentrates, maple syrup, sucrose, and raw sugar that are then added to create other foods (such as cookies). Results from a survey of forty-two thousand Americans reports that in 2008 the average intake of added sugars is 15 percent of total calories, a drop from 18 percent of total calories in 2000. This is still above the recommended intake of less than 10 percent of total calories. The US Department of Agriculture (USDA) reports that sugar consumption in the American diet in 2008 was, on average, 28 teaspoons per day (Figure 4.13 “Sugar Consumption (in Teaspoons) from Various Sources”). To understand the magnitude of the health problem in the United States consider this—in the United States approximately 130 million adults are overweight, and 30 percent of them are considered obese. The obesity epidemic has reached young adults and children and will markedly affect the prevalence of serious health consequences in adulthood. Health consequences linked to being overweight or obese include Type 2 diabetes, cardiovascular disease, arthritis, depression, and some cancers. An infatuation with sugary foods and refined grains likely contributes to the epidemic proportion of people who are overweight or obese in this country, but so do the consumption of high-calorie foods that contain too much saturated fat and the sedentary lifestyle of most Americans. There is much disagreement over whether high-carbohydrate diets increase weight-gain and disease risk, especially when calories are not significantly higher between compared diets. Many scientific studies demonstrate positive correlations between diets high in added sugars with weight gain and disease risk, but some others do not show a significant relationship. In regard to refined grains, there are no studies that show consumption of refined grains increases weight gain or disease risk. What is clear, however, is that getting more of your carbohydrates from dietary sources containing whole grains instead of refined grains stimulates weight loss and reduces disease risk. A major source of added sugars in the American diet is soft drinks. There is consistent scientific evidence that consuming sugary soft drinks increases weight gain and disease risk. An analysis of over thirty studies in the American Journal of Clinical Nutrition concluded that there is much evidence to indicate higher consumption of sugar-sweetened beverages is linked with weight gain and obesity. A study at the Harvard School of Public Health linked the consumption of sugary soft drinks to an increased risk for heart disease. First, know the number of total calories you should eat each day. Consume an overall healthy diet and get the most nutrients for the calories, using foods high in added sugars as discretionary calories (those left over after getting all recommended nutrients subtracted from the calories used). Lower sugar intake, especially when the sugars in foods are not tied to positive nutrients such as in sugary drinks, candies, cakes, and cookies. Focus on calories in certain food categories such as beverages and confections, and encourage consumption of positive nutrients and foods such as cereals and low-fat or fat-free dairy products. Before high-fructose corn syrup (HFCS) was marketed as the best food and beverage sweetener, sucrose (table sugar) was the number-one sweetener in America. (Recall that sucrose, or table sugar, is a disaccharide consisting of one glucose unit and one fructose unit.) HFCS also contains the simple sugars fructose and glucose, but with fructose at a slightly higher concentration. In the production of HFCS, corn starch is broken down to glucose, and some of the glucose is then converted to fructose. Fructose is sweeter than glucose; hence many food manufacturers choose to sweeten foods with HFCS. HFCS is used as a sweetener for carbonated beverages, condiments, cereals, and a great variety of other processed foods. Some scientists, public health personnel, and healthcare providers believe that fructose is the cause of the obesity epidemic and its associated health consequences. The majority of their evidence stems from the observation that since the early 1970s the number of overweight or obese Americans has dramatically increased and so has the consumption of foods containing HFCS. However, as discussed, so has the consumption of added sugars in general. Animal studies that fuel the fructose opponents show fructose is not used to produce energy in the body; instead it is mostly converted to fat in the liver—potentially contributing to insulin resistance and the development of Type 2 diabetes. Additionally, fructose does not stimulate the release of certain appetite-suppressing hormones, like insulin, as glucose does. Thus, a diet high in fructose could potentially stimulate fat deposition and weight gain. In human studies, excessive fructose intake has sometimes been associated with weight gain, but results are inconsistent. Moderate fructose intake is not associated with weight gain at all. Moreover, other studies show that some fructose in the diet actually improves glucose metabolism especially in people with Type 2 diabetes. In fact, people with diabetes were once advised to use fructose as an alternative sweetener to table sugar. Overall, there is no good evidence that moderate fructose consumption contributes to weight gain and chronic disease. At this time conclusive evidence is not available on whether fructose is any worse than any other added sugar in increasing the risk for obesity, Type 2 diabetes, and cardiovascular disease. Do Low-Carbohydrate Diets Affect Health? Since the early 1990s, marketers of low-carbohydrate diets have bombarded us with the idea that eating fewer carbohydrates promotes weight loss and that these diets are superior to others in their effects on weight loss and overall health. The most famous of these low-carbohydrate diets is the Atkins diet. Others include the “South Beach” diet, the “Zone” diet, and the “Earth” diet. Despite the claims these diets make, there is little scientific evidence to support that low-carbohydrate diets are significantly better than other diets in promoting long-term weight loss. A study in The Nutritional Journal concluded that all diets, (independent of carbohydrate, fat, and protein content) that incorporated an exercise regimen significantly decreased weight and waist circumference in obese women. Some studies do provide evidence that in comparison to other diets, low-carbohydrate diets improve insulin levels and other risk factors for Type 2 diabetes and cardiovascular disease. The overall scientific consensus is that consuming fewer calories in a balanced diet will promote health and stimulate weight loss, with significantly better results achieved when combined with regular exercise. While excessive consumption of simple carbohydrates is potentially bad for your health, consuming more complex carbohydrates is extremely beneficial to health. There is a wealth of scientific evidence supporting that replacing refined grains with whole grains decreases the risk for obesity, Type 2 diabetes, and cardiovascular disease. Whole grains are great dietary sources of fiber, vitamins, minerals, healthy fats, and a vast amount of beneficial plant chemicals, all of which contribute to the effects of whole grains on health. 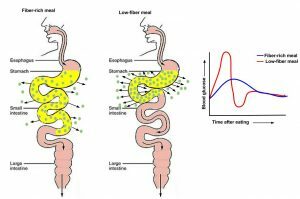 Eating a high-fiber meal as compared to a low-fiber meal (see Figure 4.14 “Fibers Role in Carbohydrate Digestion and Absorption”) can significantly slow down the absorption process therefore affecting blood glucose levels. 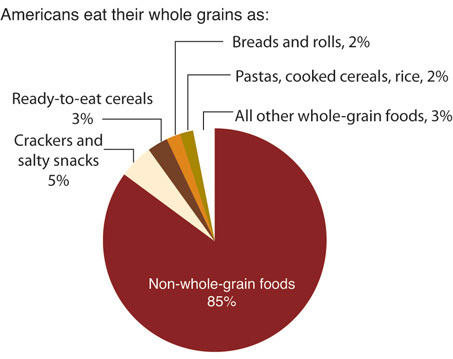 Americans typically do not consume the recommended amount of whole grains, which is 50 percent or more of grains from whole grains. Diets high in whole grains have repeatedly been shown to decrease weight. A large group of studies all support that consuming more than two servings of whole grains per day reduces one’s chances of getting Type 2 diabetes by 21 percent. The Nurses’ Health Study found that women who consumed two to three servings of whole grain products daily were 30 percent less likely to have a heart attack. Source: Economic Research Service. 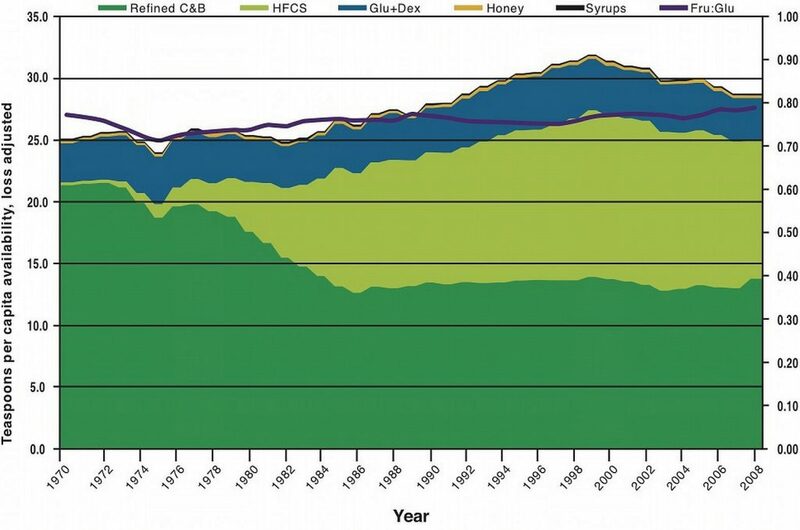 http://www.ers.usda.gov/data-products/commodity-consumption-by-population-characteristics/documentation.aspx. Health Consequences and Benefits of High-Carbohydrate Diets by University of Hawai’i at Mānoa Food Science and Human Nutrition Program is licensed under a Creative Commons Attribution-NonCommercial-ShareAlike 4.0 International License, except where otherwise noted.